Travel back in time for a brief but rich history of Green Lake, the deepest inland lake in Wisconsin, as you come aboard the Escapade for a timeless cruise. You simply can’t visit Green Lake without touring the lake itself. Explore Big Green onboard our finely designed 60-foot catamaran-style yacht, custom-built for the resort and launched in 1995. 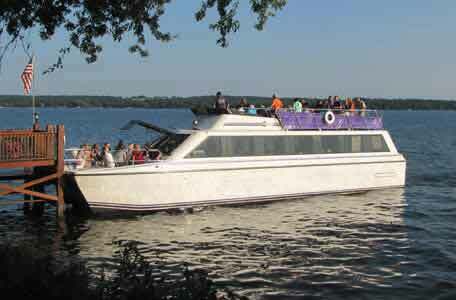 Powered by twin 180 horsepower Mercury diesel engines, the Escapade is the largest and finest entertainment vessel on Green Lake. It has a 14 ½ beam and can travel at speeds over 26 miles per hour. The Escapade provides a grand way to view the beautiful scenery and historic buildings along the shores of Green Lake. 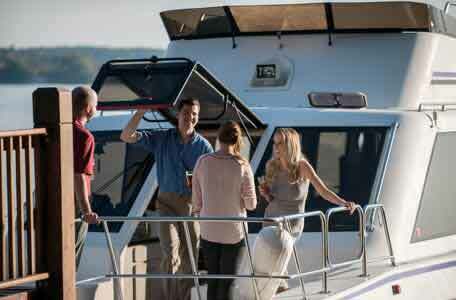 Our captains will keep you entertained as they share timeless stories of the lake and surrounding properties. Rain or shine, you’ll cruise in comfort. Tours can be enjoyed from the open, top deck or from the enclosed salon, heated or air-conditioned for your pleasure. It's time for the Escapade to get some much needed R&R after all the fun we had this season. Travel back in time for a brief but rich history of Green Lake, the deepest inland lake in Wisconsin, as you board the Escapade for a sightseeing cruise. Learn how Green Lake became what it is, hear stories of area landmarks and take in the intriguing history of local families. By the time you reach shore, you’ll be laughing and chatting with everyone aboard. Enjoy our sightseeing cruises with special twists. There’s Grey Rock Dine & Sail Experiences, which combine a beautiful dinner at Grey Rock and dessert and drinks on the Escapade. Or, perhaps you’re interested in Wisconsin beer. Then, a Beer Cruise would be right up your alley. Browse through our Heidel House Resort events to find just what you’re looking for. Your group event just became a little more unique. Trips on the yacht are a wonderful option for weddings, company outings, motorcoaches and other group events. 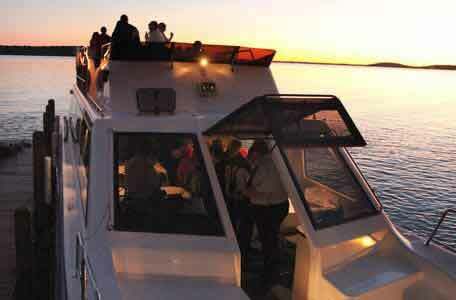 The Escapade holds up to 60 people for cocktail receptions and up to 34 for dinner cruises. To plan your private voyage, call 800.444.2812.